Ether10.Genius is a handheld tester 100% suitable for labs or field use because is full equipped (IP/Ethernet/PTP/T1/E1), battery operated (up to 24h of operation), light (1.2kg) and very rugged. The unit is able to test Ethernet/IP networks up to 10Gb/s while supporting master/slave Sync-E/PTP emulation. It also has interfaces for PDH/T1/E1/E0 and IEEE C37.94. Operation modes includes Performance, Quality and Wander tests at all interfaces and the ability to emulate and analyse PTP/SyncE, while measuring Freq./Phase, PDV metrics, analyse/generate TIE/MTIE/TDEV and TE. 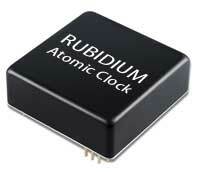 A built-in Rubidium clock disciplined with GPS provides an accuracy of a few nsec. Fig 1. How to turn-up a Synchronisation network. Fig 2. How to Qualify the Transport Layer. Fig 3. Good Synchronisation practices. Fig 4. Check the Base Station. Fig 5. Would your network pass the PTP Conformity? Fig 6. PTP Master and Slave emulation. 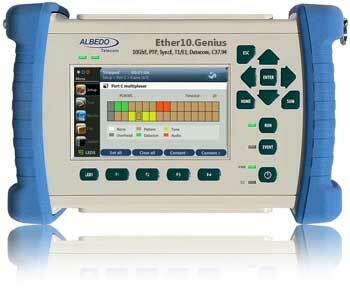 AT.E10Ge.HH Ether10.Genius hand held tester. Battery operated. 10 Gb/s Ethernet tester with optional E1, data communications and synchronization capabilities. Includes dual 10/100/1000 Mb/s electrical ports, dual SFP+ ports. QoS statistics, RFC2544 performance test, L1-L4 BER test, continuous / burst / ramp / random traffic generation, traffic statistics, error analysis, connectivity test ('ping', 'traceroute'), analysis filters, event insertion, endpoint and pass-through operation modes, graphical display of events, report generation and export. 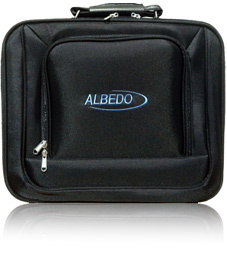 Includes AC/DC adapter, transportation bag, one RJ-45 patch cable, one BNC-BNC patch cable. SFP+ and SFP transceivers not included. AT.E10Ge.MSTR Multistream test. Generation over eight independent traffic streams. Eight analysis filters for each test port. AT.E10Ge.1564 "eSAM (ITU-T Y.1564) Test of up to 8 services simultaneously. Set up of CIR, EIR and policing rate. Per stream quality objectives. 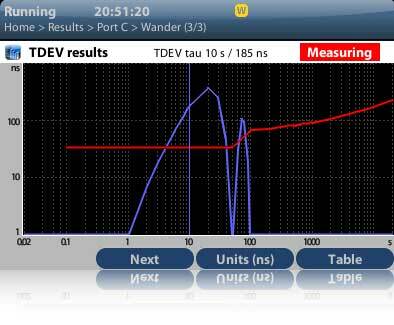 Measurement of Information Rate (IR), Frame Transfer Delay (FTD), Frame Delay Variation (FDV), Frame Loss Ratio (FLR) and Availability. [REQUIRES: AT.M10G.MSTR]"
IPV6 test. Decoding and analysis of IPV6 datagrams. IPV6 traffic statistics and events. IPV6 packet filtering. TOP IPV6 source and destination addresses (with Network search option). AT.E10Ge.MPLS MPLS test. Generation of single or double MPLS label according RFC 3032. Configuration of TTL, Traffic class, Label. Filter selection rules by Label and Traffic class fields. Analysis of MPLS. 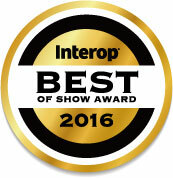 Top LSPs (with Network search option). AT.E10Ge.WIRE Cable test. Wiremap with open and short circuit detection. Measurement of distance to fault. Crossover / straight cable detection. Measurement of cable skew. AT.E10Ge.POE Power over Ethernet test. PoE / PoE+ end point and pass through as per IEEE 802.3af and IEEE 802.3at with voltage and current measurement. AT.E10Ge.NS Network Search. Automatic detection of up to 16 most frequent streams listed by Ipv4, VLAN and MAC. AT.E10Ge.E1 E1 test. ITU-T G.703 2048 kb/s testing including BNC and RJ48 connectors, E1 generation and analysis; internal, recovered and external clock references; G.821, G.826 and M.2100 performance analysis; frequency and received power level measurements; CAS ABCD bits generation and analysis; delay measurement. AT.E10Ge.DATA "Datacom. DTE / DCE emulation and datacom monitor modes. V.24/V.28 (RS-232) asynchronous and synchronous interfaces, X.21/V.11, V35, V36 (RS-449), EIA-530, EIA-530A. No datacom cables included. [REQUIRES AT.M10G.E1]"
AT.E10Ge.PULSE "Pulse Mask Analysis. Displays the pulse shape and checks compliance with ITU-T G.703 mask. Includes eye diagram operation mode and analysis of pulse time and level metrics. [REQUIRES AT.M10G.E1]"
AT.E10Ge.OWD "One-way Delay test. Measures the end-to-end, one-way delay in G.703 2048 kb/s, G.703 co-directional, V24 / V.28, X.21 / V.11, V.35, V.36 / RS-449, EIA-530, EIA-530A and IEEE C37.94 interfaces. This test requires at least two compatible test units one to be installed in the near-end and the second in the far-end. [REQUIRES AT.EGENIUS.E1 (G.703 2048 kb/s test), REQUIRES AT.EGENIUS.DATA (V.24 / V.28, X.21 / V.11, V.35, V.36 / RS-449, EIA-530, EIA-530A, G.703 co-directional test), AT.EGENIUS.C3794 (IEEE C37.94 test)]"
AT.E10Ge.C3794 "IEEE C37.94 Generation and Analysis. Unframed and Nx64 kb/s frame generation and analysis. BER and ITU-T G.821 test. Anomaly and defect insertion and analysis. Optical power measurement (with compatible SFP transceiver). Frequency offset generation and measurement. Round trip delay test. [REQUIRES AT.EGENIUS.E1 and AT.EGENIUS.DATA]"
AT.E10Ge.V24 V.24 / V.28 / RS-232 cables. V24 / V.28 / RS-232 DTE and DCE interface cables. AT.E10Ge.X21 X.21/V.11 cables. X.21/V.11 DTE and DCE interface cables. AT.E10Ge.V35 V.35 cables. V.35 DTE and DCE interface cables. AT.E10Ge.V36 V.36/RS-449 cables. V.36/RS-449 DTE and DCE interface cables. AT.E10Ge.530 EIA-530 / EIA-530A cables. EIA-530 / EIA-530A DTE and DCE interface cables. AT.80 VF adapter. IUT-T G.711 test for measurement of PCM level and frequency. AT.88 Codirectional adapter. Input / output, smart serual to DIN1628 (4 mm Siemens type) connector, ITU-T G703 E0 interface. AT.89 IEEE C37.94 adapter. 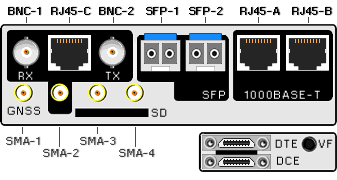 Input / output, Smart Serial to SFP, IEEE C37.94 interface. AT.92 Dual E1 Port Adapter. Smart Serial to RJ45. Balanced E1 in, Balanced E1 out. Provides a second E1 port to the unit. AT.HS Head-set 2.5 mm jack integrated headphone and microphone. AT.C3794SX.SFP IEEE C37.94 SFP adapter.2048 kb/s SFP, 850 nm, MMF, Duplex LC, 0 - 70C. AT.E10Ge.SE SyncE Clock Emulation. Synchronization testing according to ITU-T G.8261, G.8262, G.8264. Ethernet line frequency (MHz), offset (ppm), drift (ppm/s). Analysis / Generation of ESMC messages. External reference clock input 2048 kbit/s, 2048 kHz, 1544 kbit/s, 1544 kHz, 10 MHz, Synchronous Ethernet and 1 PPS. External reference clock output 2048 kHz and 1 PPS. 1 PPS input / output adapter not included. AT.E10Ge.SEW "SyncE Wander test. Synchronous Ethernet TIE / MTIE / TDEV measurement. Synchronous Ethernet wander generation. [REQUIRES: AT.EGenius.SE]"
AT.E10Ge.PTP IEEE 1588v2 / PTP Clock Emulation. PTP master and slave emulation. PTP passive monitoring. PTP message classification and analysis. PDV analysis. External reference clock input 2048 kbit/s, 2048 kHz, 10 MHz and Synchronous Ethernet. External reference clock input 2048 kbit/s, 2048 kHz, 1544 kbit/s, 1544 kHz, 10 MHz, Synchronous Ethernet and 1 PPS. External reference clock output 2048 kHz and 1 PPS. AT.E10Ge.PTPW "IEEE 1588v2 / PTP wander test. PTP TIE / MTIE / TDEV measurement. [REQUIRES: AT.EGenius.PTP]"
AT.E10Ge.E1JW "E1 Jitter / Wander. Peak-to-peak jitter, RMS jitter, max. jitter, jitter hits detection. Configuration of jitter filters. Frequency offset (ppm), frequency drift (ppm/s). Wander metrics (TIE, MTIE, TDEV). Sinusoidal jitter and wander generation. [REQUIRES AT.EGenius.E1]"
AT.E10Ge.OCXO OCXO time reference. High performance internal oscillator replacing the standard time reference installed in the application board. AT.E10Ge.GNSS Built in GPS / GLONASS RF interface (SMA connector). Provides absolute time reference required by one-way latency measurements and ITU-T G.703 2048 kb/s, Synchronous Ethernet and IEEE 1588v2 synchronization tests. 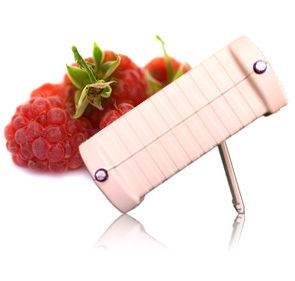 Includes compact GPS / GLONASS antenna with magnet. AT.E10Ge.GPS	 "External GPS receiver and antenna. Provides absolute time reference for synchronization tests through the GPS satellite network. Connection is through RJ-45 male interface. [REQUIRES: AT.91]"
AT.91 Sync adapter. Smart Serial to RJ45. External reference clock input 1 PPS. External reference clock output 1 PPS. Additional external reference clock input 2048 kb/s, 2048 kHz, 1544 kb/s, 1544 kHz, 10 MHz. Additional external reference clock output 2048 kHz. AT.VNC.RC Graphical Remote Control. Based on VNC for Windows and Linux. Ethernet / IP remote control that duplicates the tester graphical user interface in a remote computer. AT.SNMP.RC SNMP Remote Control and Automation. Allows user to control the tester remotely using SNMP queries. AT.E10Ge.CERT Certificate of calibration. 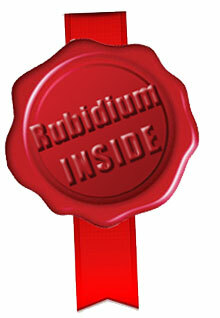 Accuracy calibration certificate, executed only when is sold and before its shipment. AT.E10Ge.CHECK Periodic Unit Verification. Includes board test verification (Calibration, Internal Frequency), test port verification (Ports A / B / C: Ethernet, SFP, unbalanced E1, balanced E1, VF Port , DTE / DCE Ports) and analog verification (level port A / B / C, line attenuation, jitter error, pulse mask).